The Bontop vintage car wing protectors. Homepage. This page: The Bontop wing pads, designed to protect a car's paint finish from scratches caused by belts and buttons. The Bontop wing protector pads from the 1930s. Anyone with a pre-war car will be all too familiar with trying not to damage the paintwork on the front wings, while leaning over to work on the engine. Buttons, belt buckles and dropped spanners all do their level best to scratch the paint finish, so a soft cover placed over (clean!) wings is always a good plan. In the 1930s' there were several products available to make the job a little tidier. Here, for example, is the "Bontop". Unlike old blankets, which tend to slide off the wing, this protector was tied down to a fixture held in place by the car's front wheel. The pad itself was made from an oil-proof material, so the occasional drip of lubricant or brake fluid wouldn't get chance to mark the finish. Likewise, a dropped set of magneto spanners, or an oil pourer, wouldn't be able to ding the surface. The trade price for the Bontop was 3 shillings, or 4 shillings retail, so a small price to pay for any motorist or garage owner, to help prevent costly paintwork repairs. 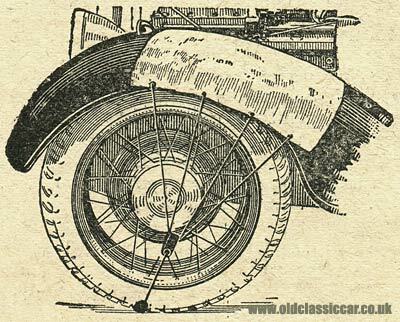 The Bontop wing protectors would have been very handy too if you were a garage using the Marquette radiator flushing machine, as with hoses rubbing against the car, damage could quite easily have occurred.